On Wednesday, May 23, 2012, the Honorable Drella Savage, a Law Division Judge in the Circuit Court of Cook County, Illinois, entered an Order approving the settlement in the case of Gabriella Cedillo, 26, who was severely injured when she was an “Extra” on the set of Transformers 3. On September 1, 2010, on a vacated portion of Cline Avenue in Hammond, Indiana, the Transformers 3 movie was being filmed. Stunts were being performed using explosives and rigged vehicles in the eastbound lane while “extras,” driving in their own cars, were driving in the westbound lane of the roadway. 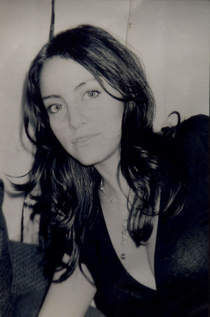 Gabriela Cedillo was among the 80 extras on set, who were driving in the westbound lanes. The stunt that caused Gabriela’s injury was attempting to create the illusion of a powerful explosion involving two vehicles. The stunt involved two vehicles that were being towed by a flatbed truck and were rigged with a cable, which was welded to the back of the car. Had the stunt been performed properly, it should have involved the detonation of explosive devices, causing the front of the car to fly up in the air, followed immediately by a sharp pulling of the cable welded to the back underside of the car, in order to cause the car to flip over backwards. On the day in question, the bracket welding on the eastbound stunt vehicle failed, causing a portion of the metal weld to fly into the oncoming lanes and strike Gabriela’s car’s hood, windshield, and eventually her head. 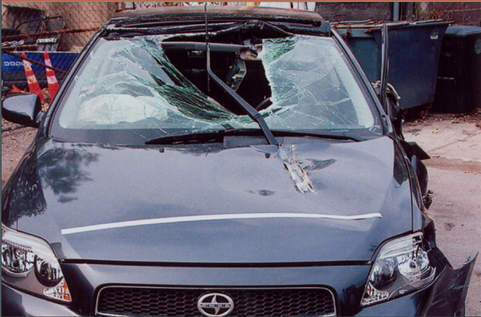 The damage caused to Gabriela’s vehicle is pictured below. On the date of the occurrence, no permits for the use of fireworks and explosives had been secured by Michael Bay or the production company. On August 31st, the day before the tragedy, the same stunt failed, and evidence indicated that the production team made hurried alterations to prepare replacement vehicles to re-attempt the stunt the next day. As a result, a completely inadequate superficial weld had been applied in a failed effort to secure the new bracket to the replacement car. Gabriela suffered severe open head trauma which resulted in her hospitalization and has left her with significant cognitive and physical impairments. Nearly a third of her skull and a portion of her brain were taken off when the metal weld struck her. 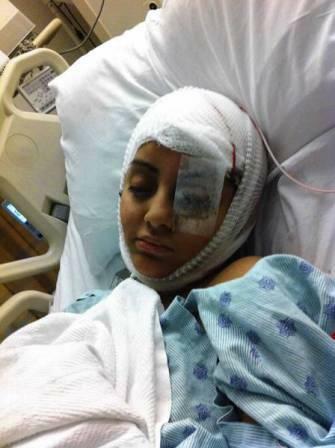 She recently underwent another surgery in order to replace the missing portion of her skull with a metal plate. The day after this tragedy, Paramount Pictures and DreamWork’s Studios publicly announced that they would take care of Gabriela’s medical bills and provide for her medical care. “In reality, these companies did everything they could to avoid payment,” said Gabriela’s attorney, Todd A. Smith of Power Rogers & Smith, L.L.P. As a result, Gabriela was forced onto public aid, with the taxpayers picking up the bill, in order to pay for her nearly $800,000.00 worth of medical bills. As a means of comparison, the Transformers 3 movie reportedly grossed over $1,000,000,000.00 world-wide. “This settlement will provide Gabi with the medical care and in-home support that she needs,” said Mr. Smith. Gabriela’s family says they are hopeful that her condition will continue to improve, but they know she has a long road ahead of her. $18.5M settlement in ‘Transformers’ accident by Maudelyne Ihejirika, Chicago Sun-Times, May 24, 2012. Movie extra gets $18.5M in suit by Jim Jaworski, Chicago Tribune, May 24, 2012.